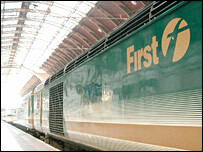 First Great Western is advising passengers planning to go away by train this Christmas to buy their tickets and book seats as soon as possible. Thousands of seats had already been reserved, a spokesman said, and trains to the most popular destinations at the busiest times were filling up quickly. With Christmas Day being on a Monday this year, travel will be concentrated on Friday, 22 December and Saturday 23. Reservations for the Christmas week opened in early November. Customer Services Director, Glenda Lamont, said: "Already thousands of people have taken our advice to buy tickets and reserved their seats in advance."